Jerry Sandusky will spend the rest of his life in prison, Penn State football played under NCAA sanctions and Joe Paterno passed away. Lance Armstrong abandoned his fight against doping allegations. Roger Clemens won his court battle, despite lingering skepticism over whether he used steroids. The impact of early-stage dementia forced Pat Summitt to step down from her coaching perch. Again and again, it seemed, the sports world in 2012 saw the end of long tales with tragic or, at best, bittersweet endings.  In State College, Pa., where the Sandusky mess at Penn State destroyed lives and radically changed the face of a proud football program.  In Washington, where Clemens emerged from court a winner, after a mistrial the first time around on charges he lied to Congress about performance-enhancing drug use.  In Kansas City, Mo., where Chiefs linebacker Jovan Belcher shot and killed his girlfriend, then drove to the team's facility in the Arrowhead Stadium complex, thanked his coach and general manager, and turned the gun on himself.  In Austin, Texas, where the news broke that Armstrong decided to give up his long fight against doping charges, saying "enough is enough" but acknowledging no wrongdoing. The move began the cyclist's swift fall from his spot as cancer-fighting sports hero in the public eye. And though he maintains he was victimized by a "witch hunt," Armstrong still was stripped of all seven of his Tour de France victories. "We must create a culture in which people are not afraid to speak up, management is not compartmentalized, all are expected to demonstrate the highest ethical standards, and the operating policy is open, collegial and collaborative," Penn State President Rodney Erickson said the day the NCAA levied massive sanctions against the Nittany Lions including a four year postseason ban. Erickson was speaking of his own school. But in 2012, at least some of those lessons could have applied to any number of topics. Sure, there were amazing moments to remember and savor. Michael Phelps became the most decorated Olympian in history, adding to his enormous swimming haul with six more medals at the London Games, where the United States topped the winning charts once again. Usain Bolt became the first man to win the 100- and 200-meter dashes at consecutive Olympics, Eli Manning and the New York Giants reigned supreme in the NFL, San Francisco stormed its way to the World Series title, the Los Angeles Kings hoisted the Stanley Cup (no telling if any other team will anytime soon) and LeBron James and the Miami Heat silenced doubters by winning the NBA title. Yet in a year like this, such times of achievement and triumph seemed few and far between. Take March 21, for example. That was the day when Tim Tebow was traded by Denver to the New York Jets, a huge story simply for the Tebowmania factor  and one that wasn't even the biggest in the NFL that day, not with the announcement that New Orleans Saints coach Sean Payton would serve a yearlong suspension for his role in the bounty scandal. Try August 15, when baseball got to experience a rarity  Felix Hernandez pitching the first perfect game in Seattle Mariners' history  and an all-too-common occurrence, that being someone testing positive for something, in this case San Francisco's Melky Cabrera basically forfeiting any shot at the MVP or the NL batting title by being suspended 50 games following a positive test for testosterone. Or Oct. 10, when Raul Ibanez showed off a flair for the dramatic  twice  by hitting tying and winning home runs as the New York Yankees beat the Baltimore Orioles 3-2 to take a 2-1 lead in the AL Division Series, an enormous moment by any measure. Of course, those blasts came on the same day that the U.S. Anti-Doping Agency released a report in which Armstrong was portrayed as the lead of the "most professionalized and successful doping program that sport has ever seen." As stunning as Armstrong's fall was, what went on at Penn State continued to dominate the sports lexicon. Sandusky was arrested in November 2011, but resolution didn't really begin until 2012  part of why the case was voted the top sports story of the year by The Associated Press, based on balloting by U.S. editors and news directors. The longtime Penn State defensive coordinator was convicted of 45 counts of abuse involving 10 boys, and later sentenced to 30 to 60 years in prison, which means Sandusky is likely to die behind bars. Paterno succumbed to lung cancer in January, and a statue of his likeness outside Beaver Stadium was removed six months later, one day before the NCAA announced a $60 million fine and four years of scholarship reductions. Still to come: civil suits brought by Sandusky's victims and the trials of former school administrators accused of neglecting their duty to report allegations. "We can expect more fallout," Erickson said. 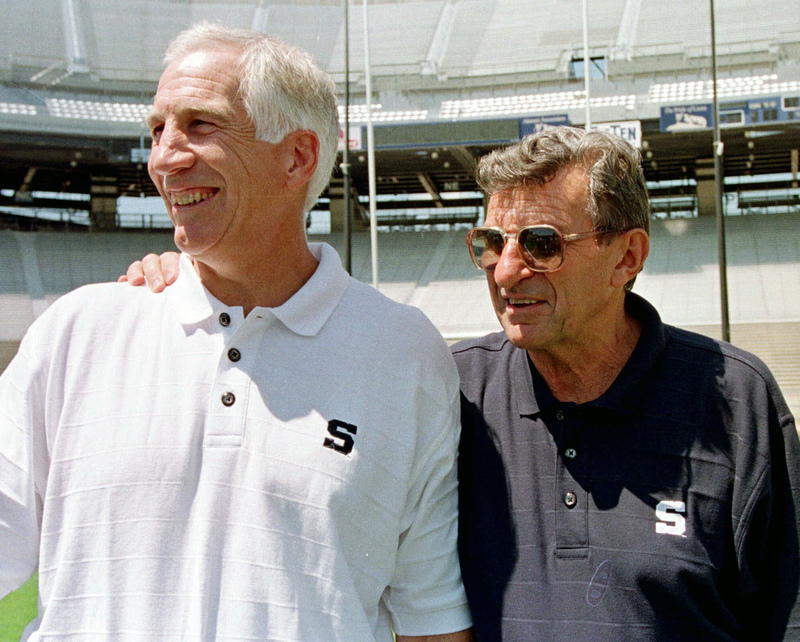 Paterno is still considered by many as a sympathetic figure, and still revered as a role model by some. Clemens' legacy doesn't seem to resonate the same way with sports fans. It's almost like his courtroom win was one that many did not expect to see happen, and it may be his last big victory for a while. Clemens  the only seven-time Cy Young Award winner  is on the Hall of Fame ballot for the first time this year, and a recent survey of voters by the AP shows that he is likely to fall well short of the number of votes necessary for induction in 2013. Clemens was accused by former personal trainer Brian McNamee in the Mitchell Report on drugs in baseball of using steroids and HGH, allegations Clemens denied before Congress. Eventually, after a Justice Department investigation looked into whether Clemens lied under oath, a grand jury indicted him on two counts of perjury, three counts of making false statements and one count of obstructing Congress. He was acquitted of all the charges on June 19 after a 10-week trial. "I'm very thankful," Clemens said. "It's been a hard five years." Armstrong's fight lasted even longer than that. The testicular-cancer survivor won the Tour de France seven times, all while dogged by the stigma of he-must-be-cheating. Armstrong was never caught by a drug test, but rather was ultimately done in largely by the words of his former teammates. Armstrong continues to deny doping, but simply said his fight had gone on long enough. Giving up has come with a price. Armstrong cut ties to his well-known charity, Livestrong, and longtime sponsor Nike  among other corporations  cut ties with him. And as for Summitt, one of the greatest names in coaching, her last loss was against an invisible opponent. Summitt stepped down as Tennessee's coach in April, a few months after revealing she has been diagnosed with early onset dementia. Summitt led Tennessee to eight national titles in her 38-year tenure, winning 1,098 Division I games along the way. "It's never a good time," Summitt said. "But you have to find the time that you think is the right time and that is now." Still, the year wasn't gloom and doom for everyone, not by a long shot. Alabama got a chance to avenge a loss to LSU and win college football's national championship, the second for the Tide in three years. The Tide will be back in the BCS title game again in January, against rising and surprising Notre Dame. Miguel Cabrera of the Detroit Tigers became baseball's first Triple Crown winner in 45 years. The Kings put together a stunning run through the Stanley Cup playoffs, the last celebratory moment the NHL got to enjoy before more labor strife led to a lockout. Baylor went 40-0 for the NCAA women's basketball title, while Kentucky returned to the top of the men's game. And the Giants (New York) and Giants (San Francisco) more than lived up to their names, in championship fashion. But if there was one happy ending among all those the drawn-out sagas of this sports year, it was the year James had with the Heat. Miami won the NBA title, beating Oklahoma City in five games for the franchise's second title and the first for James, who left Cleveland for the Heat two years earlier for moments such as that. He won the league's MVP award. He won the NBA Finals MVP award. He even helped the Americans win another basketball gold medal at the London Olympics. After all he went through  from hero to villain, revered to pariah for his infamous "Decision"  James found a way to shake it all off and complete his quest. "It's a year I know I'm never going to forget," James said. Thing is, in so many cases in 2012, it isn't for the right reasons.